Do you know the answers to these horror-themed questions? Try if you dare! Print out this crossword puzzle to see how well you do! Stay-tuned for the solution puzzle. 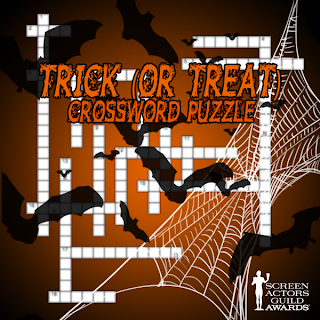 A Trick (or Treat) Crossword! 3. How many brides does Dracula have including Elisabeta? 7. The zombies in the television series "The Walking Dead" are referred to as _____. 9. In the movie "Jaws," what is the name of Quint's boat? 10. The vampires in the television series "True Blood" cry tears of ______. 11. How many times has "Friday the 13th" been remade? 12. Who's face is featured on the poster of "Scream" despite only being in the film for 12 minutes? 17. "True Blood" uses _____ to scare off the vampires. 18. The newest season of "American Horror Story" takes place where? 19. In the third season of "American Horror Story," what is seen crawling from the women's mouths on the poster? 1. What was Johnny Depp's first film? 2. Who composed "Jaws" theme song? 4. Who was the creator of Frankenstein's look? 5. The name of the high school in "Carrie" refers to which other horror film? 6. The producer of Spider Man 3, Sam Raimi, is also known to be the director of what famous horror film? 8. "You've just crossed over to the Twilight Zone" is said by whom? 13. Where was the cabin located in the horror film "The Evil Dead?" 14. Jessica Lange has won how many awards for her roles on "American Horror Story?" 15. The phrase "seven days" comes from what horror film? 16. How many men propose to Lucy before Dracula marries her?